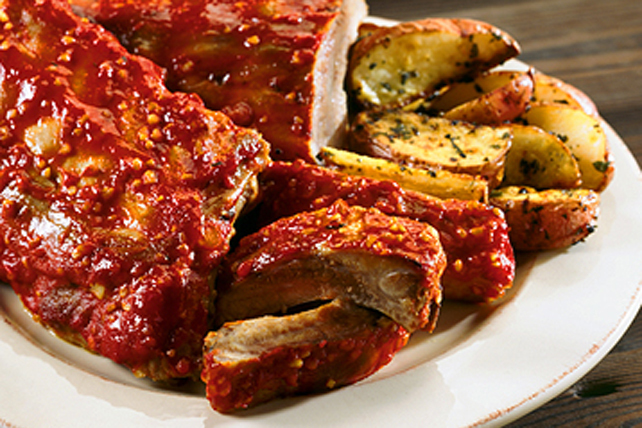 Try one saucy bite of our fall-off-the-bone baby back ribs. These pub-inspired ribs are baked to tender perfection. Place ribs, meat sides up, in single layer on 2 foil-covered rimmed baking sheets sprayed with cooking spray. Mix remaining ingredients until blended. Pour 3/4 of the chili sauce mixture over ribs; cover. Bake 50 min. or until ribs are tender, turning occasionally and brushing with pan juices. Brush with remaining chili sauce mixture; bake, uncovered, 10 min. Serve with cooked potatoes wedges. Ribs are done when the internal temperature tested in the thickest part of the ribs registers 160ºF. For best results, use an instant-read thermometer to test the meat, being careful to not let the thermometer touch any bones.